A den is a small room in a house where people can pursue activities in private. In the United States, the type of rooms described by the term den varies considerably by region. It is used to describe many different kinds of bonus rooms, including studies, family rooms, home offices, libraries, home cinemas, or even spare bedrooms. In some places, particularly in parts of the British Isles, a small den may be known as a snug. While living rooms tend to be used for entertaining company on formal occasions, dens, like other family rooms, tend toward the more informal. In houses that do not have dedicated family rooms or recreation rooms, a den may fill that niche. Dens can also be private areas primarily used by adult members of the household, possibly restricting access to the room by their children. Dens with home theater systems and large screen televisions may be referred to as media rooms instead. 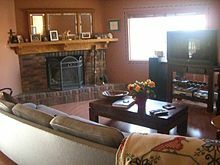 Most den floors are made out of wood, carpet, or floor tiling. Dens can serve the same purpose as cabinets in the past, becoming a modern man cave—a place for men to gather and entertain. In such cases, the design and decor may be distinctively masculine.